After being drafted by the Houston Astros in the fourth round this past June, Alex McKenna endured a month-long delay between college and the start of his pro career. Having had to finish up classes at Cal Poly following the conclusion of their season, it took the Big West Conference Player of the Year a couple of weeks before putting ink to paper and starting his professional journey with Tri-City. 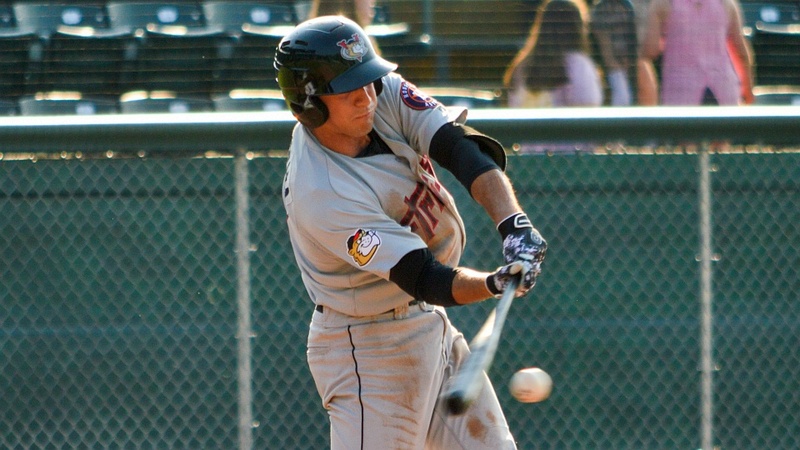 Despite the layoff, the ValleyCats outfielder is now hitting his stride at the plate -- though it didn't happen immediately. "The first 30-40 at-bats up here, my timing was a little bit off," explained the Astros' No. 30 prospect. "I was trying to figure out the kinks on getting back my swing, so I started out pretty slow to be honest. It wasn't a very quick transition. I didn't come and hit well right away." McKenna hit .200 over his first 30 professional at-bats, with just one extra-base hit and 11 strikeouts. Then on July 11 he registered his first multi-hit game, versus Williamsport, and momentum swung in his favor. Over his last 18 games, the 20-year-old has recorded eight multi-hit games and is hitting .369 with 14 RBIs, nine runs scored and just nine strikeouts over 65 at-bats. "It just started to take off here over the last couple of weeks," McKenna said. "I think I've just been seeing the ball well, putting good swings on pitches and trying to do my best to drive the baseball with authority to all fields. That's been my biggest goal in this first year is try and figure out how I'm going to elevate the baseball more and tap into some of the power that I think I have." Hailed by scouts and analysts as a "raw power" guy, the California native is starting to bring that to the forefront of his game, having launched five home runs over his last 12 contests, including long balls in three straight games. He has already matched his power output from his junior season at Cal Poly, in which he played 57 games. McKenna is enjoying working on that aspect of his game, switching the approach he used to post a .339/.424/.526 line with the Mustangs this year. "It's more of a conscious effort on my part to get pitches in certain areas that I know I can elevate and drive," he said of his current approach. "I think maybe in college I tried to just kind of hit all pitches and try and hit them hard. In retrospect, sometimes that gets you out -- you're swinging at a pitch that you might not necessarily have been able to get into the air or put a good swing on. My contact rate in college was pretty high. I probably made contact too much because I was swinging at pitches that maybe were not the best pitches to do damage to." With a month to play in his first pro campaign, McKenna is grateful for the opportunity to hone his craft at this level, though after three seasons of college, summer and fall ball, he also is looking forward to the offseason, in which he has zero plans to stop working. "It's been a good year. There's been a lot of great things that have happened. I'm having some success at this level which is good to see," said McKenna. "I'm kind of looking forward to the offseason to prepare my body for the next season. I think it's a big step for me as far as my next phase of baseball. I want to see how I handle it. I want to get stronger, get faster. It's a lot more time than I'm used to taking off, so I want to work on everything, come back in shape and ready to attack the next season. The next season will be the biggest test for me going forward." Earning it: Staten Island right-hander Nolan Martinez has gone four straight outings without allowing an earned run, covering a span of 18 2/3 innings. In five of his seven outings on the season the Yankees No. 27 prospect has not allowed an earned run. If you remove his first start of the season for the Baby Bombers, in which he gave up four earned runs, the 2016 third-rounder has posted a 0.28 ERA over the 32 innings since. Overall, Martinez is 4-0 with a 1.23 ERA and is holding opponents to a .172 batting average. Numbers game: Batavia's Sean Reynolds can lay claim to one of the more unusual stat lines of the season. The 6-foot-7 first baseman leads the league with ten home runs -- three more than anyone else in the league -- and has also driven in a league-best 31 runs and drawn the most walks with 32. He is also a clean 8-for-8 on steal attempts. On the flip side, he also leads the league with 87 strikeouts in 170 at-bats (twenty more Ks than any other batter in the league) and has posted a .206/.340/.441 line through 48 games. Zero effect: Brooklyn hurler Jaison Vilera saw a run of four straight starts with a win snapped in a no-decision effort versus Hudson Valley. During that streak, the Cyclones right-hander was 4-0, allowing no runs while striking out 31 batters and allowing just 12 hits and seven walks over 26 2/3 innings. The Venezuelan native leads the league with 63 strikeouts over 50 1/3 innings on the season, is tied for first with five wins and ranks second with a 1.43 ERA in nine appearances.